So take a chance and don’t ever look back. 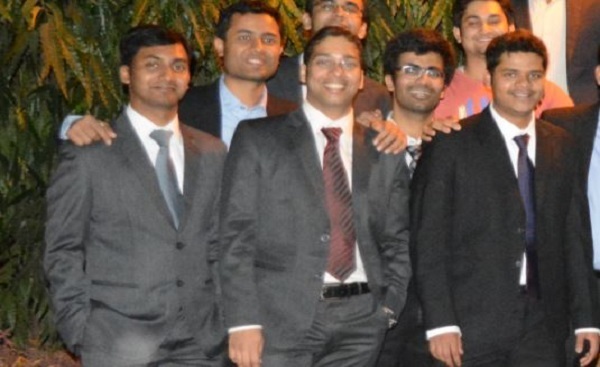 Arpit (guy at the extreme right) is pursuing MBA and shares his wonderful experience of internship days. “This is an opportunity for not only the company to evaluate you but also for you to evaluate the field of Sales & Marketing”, my guide said when we first met. I thought that I will be sitting in-front of the laptop for 8 hours a day trying to make sense out of random sales data thrown to me. Little did I know about the experience I will have in the next 2 months. I was posted in Chennai in the Consumer Marketing division (closely related to Sales). On the first day, I was greeted by friendly HR and Staff who worked in an office which had a mini library, pool table, Gym and a Foosball table. I was told to go to the market (basically the outlets) and start with my project. I had no clue what to do and how to do anything in a place which doesn’t speak the languages I know without any transportation of my own. I spent around a week in high value stores observing the attendants while trying to communicate in Tamil and English. This was an experience I could have never got in a classroom. I observed consumers and attendant. I noted the sales calls they made, the costumer touch points and what competitors are doing. All the while, I made sure my guide gets a daily report. I learnt at a later stage that this would prove to be very important aspect in building relationship with my mentor. My project involved working closely with an external agency to understand how sales promoter works and the challenges they faced. I visited several outlets on a daily basis and talked to the promoters trying to get an insight. It was the first time I realized how important it is to build relations in the field of Sales. I submitted my report to my guide and my targets (KPIs) were set. After this, I spent days contacting vendors for the solution I suggested. It was a fruitful experience in negotiation and relationship management. Running against the deadlines while I was getting used to a new city and culture was something I never anticipated. I interacted with almost everyone from the sales and consumer vertical for my project work. I was surprised by how approachable and friendly everyone was at GSK. I understood how several sales channels work in tandem with each other. I also talked to outlet mangers, owners, customers and distributors. I realized how important it is to stay in touch with all the stake holders in the field of sales. Finally I came up with a training module for the promoters. To my surprise, I was given a green signal to implement my module. I traveled to several cities in Tamil Nadu and organized training sessions for the promoters. I have never heard of a company which let an intern formulate, plan and execute his idea with the willingness and confidence that GSK had. That’s my internship in short. Now to sum it up. Learning opportunities: GSK is an elephant in South India and I was exposed to all the facets of sales and consumer marketing. Work culture: Very friendly, I never felt like I was just an intern. Office hours were filled with fun-filled breaks in between the work. Sales force was helpful and understood my needs. Project: It was a mixture of office work (read excel and ppts), market visits, client meeting, partner meetings. My mentor made sure he was there to help me out. My advice to you: Consider your internship as an opportunity to learn about the field you are interested in and not as a way to get PPO. Show willingness to learn and shed your inhibitions, be ready for surprises if it’s Sales. Also, report to your guide regularly, He/she will be busy most of the time, but rest assured that people would be watching you all the while. If Arpit’s experience motivates you, you can check the latest internships in Chennai and sales and marketing internships.